WP ERP is one of the plugins that has changed the purpose of WordPress to its users. It is a noteworthy example of using WordPress for a greater cause like managing businesses. Being first of it's kind, WP ERP is successfully aiding 7,000+ businesses all over the world! After it's release, we initially planned to make individual premium extensions alongside the FREE core modules. And it was a huge success. Customers were able to choose from around 25+ extensions that solve specific business problems. 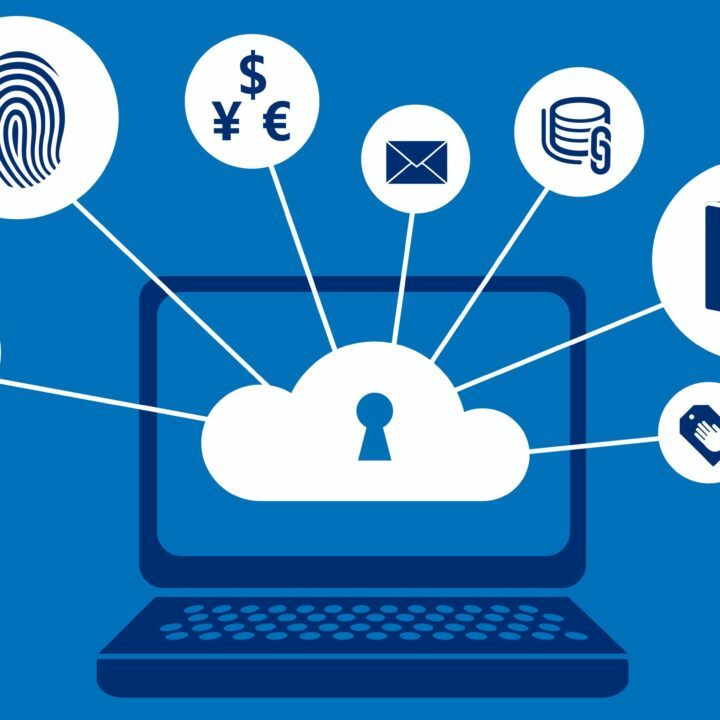 Now, we have analyzed the need of our users and find out that they want to automate their business process and the crucial truth is that the requirement is not the same. This means that individual business owners need specific solutions. For example, an HR manager of a company would like to automate his HR department. Similarly, a small business owner might feel the necessity of managing his clients and customers in a better way. This gave us a clear direction that – whatever pricing or planning solution we would offer, it wouldn't be adequate for everyone. Thus, we decided to make things easier for everyone. Our first step was to find out how we can help everyone. So, we aimed to bring bundles and it was also helping a lot of people. This helped us to get a clear idea of the requirements of our users. After a long analysis and research, we came up with a new pricing idea that could potentially lower the cost of our users and also fulfill their requirements. Here, we present a new pricing package that all our customers have been waiting for a long time. As you can see, it is possible to get started with WP ERP from as minimum as $149 only! If you go through the pricing packages, you will notice that the higher the package is the more you save. Let's have a look into the HR management packages. There are three packages in HR and the first one, the Starter pack is $199. This package gives you 3 exclusive extensions – HR Frontend, Attendance and Document Manager. These are the most popular extensions for HR managers. Along with it, you will be getting 1 year of support and regular updates. The price of the second package, Essential is $399. This package comes with 6 premium extensions – HR Frontend, Attendance, Document Manager, Payroll, Asset Manager and SMS Notification. The price of all these 6 extensions is $454. This means – you will be saving around $55 which is 12% of the actual price. The Business package is available for $599 and it contains 9 extensions and they cost around $761. So, you save $162 (29%). Isn't it a great deal? 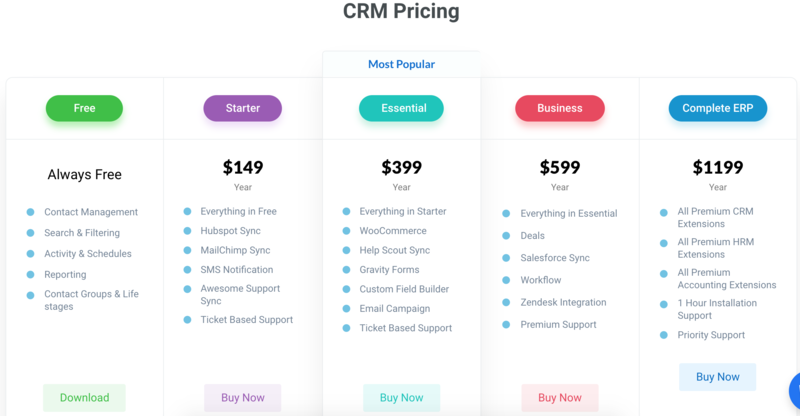 According to the CRM pricing, the Starter package costs $149 and contains 4 extensions. Their total price is $156. So, you are saving a few bucks. On the other hand, the CRM Essential Package is $399 and gives you access to 9 premium modules. Their total price is $621, so you will be saving $222; saving up to 36%. The Business package is $599 and contains 13 extensions. If you look at their actual price, which is $997, you will realize that you are saving around 40% of the actual price, $398! 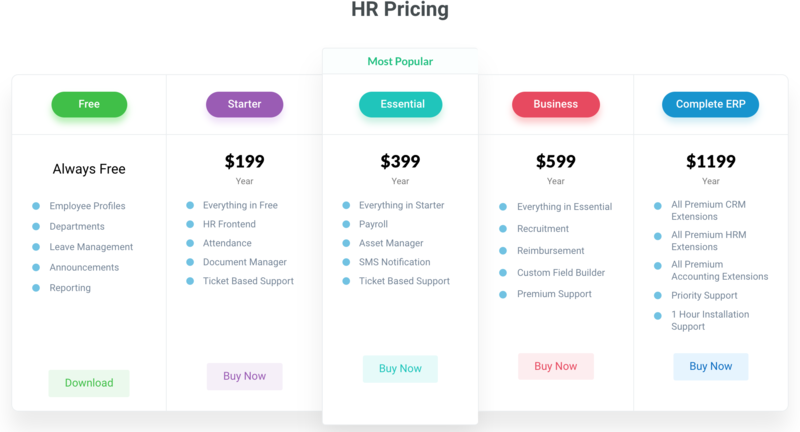 This pricing shows that Starter comes with Payroll and Payment Gateway extensions for $199 and let you save around 12% ($29). The Essential package contains 4 exclusive extensions worth $406 and you can get it for only $299. This saves you $107 (27%). Finally, the Business package of Accounting contains 6 extensions and will cost you $399. The actual price of these 6 extensions is $634, which means you are saving $235 (35%). You might be thinking, what happens when you want to buy everything together. 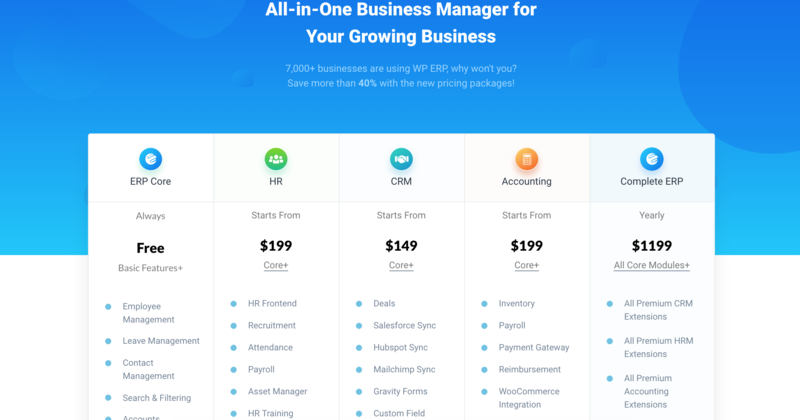 Well, there is a new pricing package, Complete ERP and it contains all the premium modules of WP ERP along with premium support and 1 hour of installation support. This new package will cost you $1199. It might look pricey, but the total price of all these 22 extensions is $1728 and you are saving a big amount, $529 (30%)! P.S. This offer will end on July 24, 2018. So, grab the deal now! Also, do let us know what you think about this new pricing and how we can improve to help you manage your company in a better way. Data Story Teller, System Analyst, and WordPress Blogger. Passionate about Researching, Data Analysis, Email and Content Marketing. Always ready to learn new things and take challenges. Loves to help and empower team members.